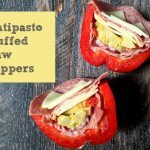 These antipasto stuffed raw peppers are the perfect low carb or Paleo lunch on the go. There are two ways to eat these: Slice long ways and stuff like a boat or cut the tops off and stuff like an apple. To make the apple way: Cut off tops and clean out the seeds and ribs. Start with the meats and layer one piece of each. Top with the meat and cheese again. Put top back on and wrap in plastic wrap if taking for a lunch or picnic. To make like a boat: Slice in half long ways. Clean the seeds and ribs out. Layer meats, then artichokes, then cheese and meats again. Top with an olive from the artichoke salad with a toothpick.